What is the LEN Function? 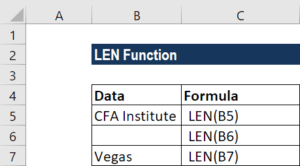 The LEN Function is categorized under TEXT functionsFunctionsList of the most important Excel functions for financial analysts. This cheat sheet covers 100s of functions that are critical to know as an Excel analyst. The function will return the length of a given text string. In financial analysisFinancial Analyst Job DescriptionSee a real Financial Analyst Job Description including all the skills, experience, and education required to be the successful candidate for the job. Perform financial forecasting, reporting, and operational metrics tracking, analyze financial data, create financial models, the LEN function can be useful if we wish to get the length of a given text string as the number of characters. LEN will also count characters in numbers, but number formatting is not included. 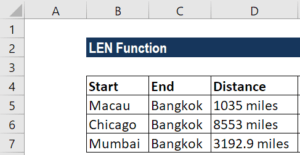 How to use the LEN Function in Excel? Spaces are counted as characters. Hence, the function returned 13 for the first argument. We wish to remove miles from the Distance column. For removing the last n characters from a text string, we can use a formula based on the LEFT and LEN functions. 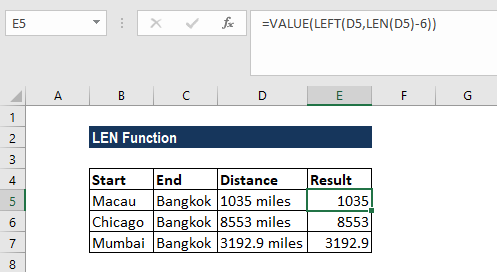 We can use a formula to strip the last 2 characters, last 5 characters of a value, starting on the left. The formula to use will be =VALUE(LEFT(D5,LEN(D5)-6)). In the formula above, the LEFT function extracted characters from the left side of a value as we specified. We then used the LEN function to calculate the total length of each value. For example, the length of 1035 miles is 9. To get the number of characters to extract, we subtracted 6, which is the length of ” miles” (including the space character). The result is 4, which is fed to LEFT as the number of characters to extract. LEFT then returns the text “1035” as a text value. As we wanted a numeric value and not a text value, we ran the text through the VALUE function, which converted numbers in text format to plain numbers.